Editor’s note: A PW member, ahsanzs, who is more or less a technical guru recently took his CNG car for testing of his cylinder and posted the entire ordeal on PW forums. For your pleasure, I am presenting you his in-depth written article on his endeavor. Be sure to be on the safe side rather the dark one folks. On every fuel station there’s a big board telling us that they will not fill CNG in vehicles which have cylinder older than 5 years. And that according to Pakistan CNG rules 1992 everybody has to get their cylinder tested after 5 years. I have never seen any fuel station denying filling up of CNG, except a Shell station once asked me, ‘your car is looking too old, we will not fill it to tank full level.’ after which I indignantly told then that I bought the cylinder new 4 years ago and once 5 years milestone is near, I’ll myself get it tested just for the sake of safety. Anyhow recently I came across a car which had CNG kit fitted since eons and thought of taking it to HDIP for testing. This is mainly because of personal responsibility and general regard of safety. After all, my family are the ones who sit in this car. Nowadays CNG cylinder is very expensive (main reason being fitting of CNG in diesel buses and trucks, which require 8 or 10 cylinders at a time). A cylinder I bought for Rs. 5000/- in 2007 now costs Rs. 18000/-. Like every Pakistani, I’m also tight on budget these days. But still, I concluded that Rs. 18000/- even though high, is not greater than the lives of me, my family, the person operating the fuel dispenser on the fuel station or other people present on the station during filling up. That’s why I opted (opted, because the regulation is not being enforced even mildly) to invest into Rs. 550/- testing fees, driving my car to a lab far away, taking the time off from office/personal activities to go there and back, running it for 3-5 days on petrol (and getting the petrol system up to mark for this purpose, also costing money) and be prepared to spend Rs. 18000/- plus fitting charges if the cylinder fails the test. 1. Maybe the HDIP have a quota of this many cylinders to pass and this many to fail. Therefore testing may not be done properly and only for paper-filling. 2. What if the staff were dishonest and they exchanged my cylinder, which may be perfectly OK, with someone’s which is failing (for some money or whatever)? 3. What if somebody stole my cylinder (as the lab is in a desolate area, anybody could trespass)? Who will recover it? Will it be insured against theft/robbery during its stay in the testing facility? (Are you laughing?) In this case I’d have to bear the expense of replacing cylinder whether it was faulty or not. 4. Could somebody bribe the staff into and get their cylinder passed when it would actually be failing? I consulted different people who came up with different answers. Most came up with: testing is not necessary, cylinders never fail etc. I told them that even if testing isn’t necessary, it is a legal requirement. The same way you couldn’t drive a Suzuki Bolan in front of the gate of US Embassy (when it was on Abdulla Haroon rd.) for years, the law may or may not be agreeable but it is still a law with legal consequences if not followed. Eventually I met an old-time friend who is MSc from FUUAST who has recently performed internship with HDIP managed to alleviate my concerns, told me that testing is done honestly and properly and there is no particular thing to worry about. Also, HDIP is a federal institution and federal ones work in a much better and consistent fashion (as compared to provincial and local govt.) and have less corruption. It was then that I gained trust on HDIP and was finally ready to get CNG cylinder tested. CNG load shedding has come into effect here. It will happen every Monday and Tuesday. Therefore it is cost effective to fill up on Sunday, drive around on Monday, the tank will be empty on Tuesday and you take it to HDIP. You can take your car there on a tank full, but the CNG will get wasted as it is unmounted. You and others will also face breathing discomfort as they empty the tank there and then. I was lucky in that I kept running on red light for 30km and CNG finished just as I stopped in front of the gate for entry pass. HDIP Karachi laboratories phone number is 35090834. The timings are 0900 to 1630. Lunch time is 1330 to 1430 (different from other companies). The CNG cylinder testing lab is off on Saturdays. (Maybe the other departments work on Saturdays). Reaching HDIP is a chore. You drive from FTC to KPT interchange (Qayyumabad bus stop, if you feel more comfortable with names of bus stops than names of roads). This is called Korangi road. Keep going straight. The road will descend into Malir river and again come out (don’t go in rainy season – the causeway doesn’t generally flood but could be the same day you are going – why take a chance). This intersection is called Korangi crossing (Only God knows what crosses what here). Keep going straight. You’ll reach CBM (IoBM), an institute famous for its MBA degree. Right in front of the gate of CBM, there is a right exit. Take this. You’ll see lots of tankers parked on it. As you go along, the road will turn left and you’ll end up at the gate of Pakistan oil refinery. Just on the left of the gate is a narrow (and desolate) road continuing along the boundary wall. Continue. After a few hundred metres you’ll see HDIP on both sides of the road. The CNG cylinder lab is on the left. Go to the gate and get token. Then enter the compound and traverse to the left side (I’ve shown this with red arrow). The staff is good-natured and communicative. But they work with government speed and in relaxed manner. Also, they do not have extremely detailed knowledge of all procedures, therefore if you have very detailed and specific questions, look elsewhere. The staff asked me whether the cylinder has been tested before. I told them that this car has been recently handed over to me and I could not find the manufacturing date among all the things engraved on it. Therefore they looked and ascertained that the tank had been manufactured in May 2004. Even presuming it spent 6 months to 2 years or more in godowns etc. before coming into service, the testing was still due. So the tank was taken off the car. It took around 30 minutes, while waiting for another car’s cylinders to be fitted and yet another’s to be dismounted. Also, some other things came to my knowledge. One was that the cylinders worldwide are made compatible to NZS 5454:1989 Standard requirements for lightweight steel automotive compressed natural gas cylinders for use in New Zealand. That’s why NZS 5454 is also engraved on the cylinder. Maybe other countries do not have their own standard, so the factories have adopted New Zealand’s? Or maybe New Zealand’s standard allows more tolerances than others, therefore manufacturers feel more comfortable with it. Wikipedia tells me that New Zealand was the oldest to adopt CNG. Maybe when big factories were being setup, NZS 5454 was the most developed/established/comprehensive standard therefore it was so widely adopted. After which maybe other standards developed to comparable levels but factories are reluctant to move every other day. Small ones don’t have the budget or skill, large ones don’t want to put in this much capital once again. (It is also unadvisable to shift from one standard to another after short periods from the point of view of engineering statistics). Will have to work on this one. The other thing was that us Pakistanis aren’t as hopeless as we may think. The lab staff told me that most people come of their own accord. 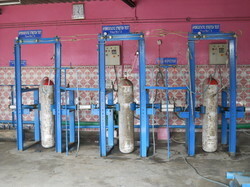 Also, most testing is of fuel station cylinders (they have entire banks of cylinders). I myself saw 3 Mazda 6-wheelers come loaded with CNG tanks of extraordinary size which couldn’t reasonably fit in any vehicle. Upon asking it came clear that they came out of a fuel station battery. Another uncle with some Chinese make microvan was waiting. I interviewed him as to what is causing him to get the cylinder tested. He just shrugged his shoulders and said he bought this vehicle (which was battered and looking like driven for commercial purpose) zero-meter 5 years ago and now decided to get its cylinder tested because its something good. ‘Wow! Personal responsibility,’ I said. He also had taken great pains to come there as he wasn’t familiar with the area. It is suggested you take a Rs. 500/- + Rs. 50/- note as ‘khulla’ or ‘toota’ is seldom available. If you have Rs. 1000/- or Rs. 500/- + Rs. 100/- or Rs. 500/- + Rs. 500/- and they don’t have change, you’ll have to give the entire sum in advance and they will write on the backside of the slip that Rs. X will be given back to you on delivery of cylinder, if they don’t have change. I gave Rs. 600/- and fortunately got Rs. 50/- back. The charges are proportional to the number of cylinders and not the number of vehicles. This means Liana/Spectra owners have to pay for 2 cylinders and Santro owners have to pay for 3 cylinders, which is quite unfortunate as people having other vehicles gain the same advantages with only 1 cylinder and also will have to pay less at HDIP. Other measures I took: Writing number plate and my name using permanent marker on the cylinder, and remembering other features. These features are usually hidden as after testing, HDIP spray paints the cylinder for God knows what reason before handing it back. I tried to find the reason and after some discussion found out that they make the cylinder most rust-resistant by this method. I argued that the effectiveness of oil paint is not comparable to the powder coating that comes from the factory. I wasn’t comfortable with the idea of painting, as it would alter the appearance and make identification difficult. However, the unique serial number would remain there. Also, the power coating is not sanded off before applying oil paint, therefore original rust protection remains. The valve at the mouth of cylinder is also taken in. I didn’t try to get it removed and keeping it with me. Maybe they return it if you ask. Anyhow I got the same one back after testing. People who will get their cylinder dismounted elsewhere and send it to HDIP via loading vehicle should note the registration number. This is because they write both the registration number and cylinder serial number on the certificate. There is a notice (in tatters) on the gatehouse mentioning this. After handing over of receipt, you are asked to come the third working day. This is Thursday if you submit on Monday, Friday for Tuesday, Monday for Wednesday, Tuesday for Thursday, Wednesday for Friday. They also told me if there is unrest in the city, I should automatically add one day. The lab phone number (as mentioned on the receipt) was never picked therefore it is safe to assume that you do not have any method of knowing whether your cylinder is ready to be given back. Because in the following days, one day there was unrest in the city. Therefore I increased one day and then went to HDIP. They quickly found out my cylinder. I also identified it because of some of its features and because the number plate and name I wrote was visible beneath the fresh spray paint. They told me they will put the tank on the seat. Now what I knew was that they would fix it back. So I said that you people should fix it back. They put the cylinder on its stand and fit one nut and bolt. The second one was rusted and they didn’t make an effort (oiling etc.) and left it. Therefore I started my journey back. They gave me this certificate. In previous testing date, they wrote the manufacturing date. This is agreeable as cylinders that are manufactured are tested before they are shipped. The next testing date is 5 years down, which in my personal opinion should come nearer and nearer as the cylinder approaches end of life. They also put a date stamp on the cylinder itself, therefore even if you lose the certificate, you can still show the engraving to any inquiring person. A windscreen sticker was also part of the package. I’ve seen similar ones on many vehicles, but never knew they were a CNG cylinder testing certificate. Before the tank could be fitted, (second support and CNG pipes), the fuel pump (petrol supply) failed. The car would start and die of its own accord. I tried to DIY the work with the help of some people. We managed to fix the second nut & bolt by oiling it. But while fitting the pipes, we could not seat the threads properly and as a result had to buy a new valve worth Rs. 850/- from the market. (The pathetic HDIP oil paint just keeps peeling off making working conditions more difficult. I had tried to opt out of it but it is compulsory). Also got a new fuel pump and, before submitting the cylinder, there were problems in fuel supply. I had to get the petrol line replaced, which cost me Rs. 430/-. Total expense: Rs. 430/- (bringing petrol system to order) + Rs. 550/- (testing fees) + Rs. 3500/- (running for four days on petrol, this is too much consumption, will look into it – I was estimating Rs. 2200/-) + Rs. 850/- CNG tank valve + Rs. 1000/- fuel pump + fitting labour. This is in order to make it transparent to you people that other overheads can occur. And oh, count in a cumulative 12-13 hours in which I was stranded because the fuel pump acted up. Anyhow the ‘khwari’ was worth the satisfaction that the cylinder is OK. Thank you for sharing such a usefull information. i just want to know that if the HDIP staff is not fitting the cylinder back and also not ensuring that the cylinder has been fitted properly and gas leakages are also checked .. what is the use of these tests since if gas leaks it is equally dangerous …it should be their duty to check the cylinders and provide proper fitting..
What if test result is failed??? will they return the cylinder in one piece? ?